Kumaresh: "Carnatic music is bounded by raga and tala"
Violin maestros Ganesh and Kumaresh best known for their raga and tala have contributed immensely to ‘Shastriya Sangeetham’. Ganesh and Kumaresh started their career at the age of 7 and 5 respectively, but even after years they tie their audience with their different raga and tala. Kumaresh who was a panellist at ‘IndiEarth Xchange’ 2012, shared his expertise on being a musician in Indian classical music for over 40 years. Their first music performance was in the year 1972. In conversation with Radioandmusic.com, he also spoke about his soon to be launched album and musical concerts. How was your experience becoming a panellist at IndiEarth Xchange? It was a wonderful platform for sharing ideas, information and future thoughts on how to take Indian artistes forward. It was a great arrangement of congregation of minds which have superfluous ideas, as things could move forward in the Indian art space. Being located in Chennai, do you see this as an opportunity for the southern musical artistes? I think the whole idea behind the event was to create a platform for independent art forms. It was very good but I think they should have included Indian classical art forms in a big way because Indian music is totally incomplete without the classical medium. Indian classical platform is very big and everything from Bollywood music, Indian pop and Indian folk is based on the classical form. Maybe, they could have taken inputs from the Indian classical art in promoting this platform. 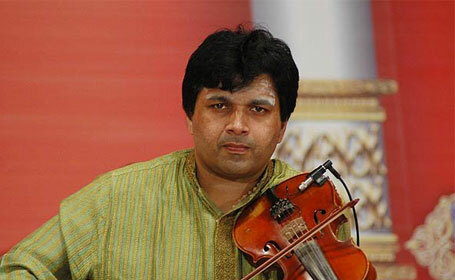 Do you think it’s challenging for the Indian classical artistes to survive? Absolutely not, this is where the misconception lies. Indian classical artistes spend a lot of time introspecting on music and practicing music. We have many places to perform which the mainstream media does not highlight and that is why many people are not aware of the art form. For example, many festivals are happening in Dharwad, Karnataka but how many people know about it. Like the one in Thanjavur that is happening every year in the month of January. Likewise in Trichy, Coimbatore, Varanasi and Jalandhar; so we have festivals happening but many people are not aware of these things. It does not get projected in the media but there is a big platform for many practicing musicians who spend lots of time understanding the art, music before performing. Media does not project that but it’s okay. What way is carnatic music challenging compared to others? Mode of carnatic music is very challenging. Other forms of music have no boundaries, no grammar. You just come out with the melody and try to adapt to the form of music like rock, pop and jazz. In this form of music, there are five-six people who work on ideas, melody, rhythm, composition and it’s done. But in the Carnatic or Indian music art form is there is something called as a raga and tala, so the composition of whatsoever you are performing cannot cross the grammatical boundaries of the raga. Unless, you don’t understand it very well you cannot perform the raga of anybody’s content. Understanding the medium takes time. The plus point is once you start understanding the raga, understanding the system of Carnatic music or Hindustani music you expand your capacity to create and that’s the plus point in Indian music. What you think about the role of lyrics in classical music, is it a hindrance? You don’t need lyrics in classical music. I wouldn’t call it a hindrance, you don’t need it when you play instrumental music. How is Carnatic music bounded? Carnatic music is bounded by raga and tala. It is called boundary. We have a discipline in a particular society. Likewise, in music we have a discipline that is raga. For example, if I am playing a raga called ‘Kalyani’, whatever I do should be within the boundaries of ‘Kalyani’. We stick to the grammatical boundaries of raga. That way it is bounded but what you can do by expanding your knowledge or by expanding your creativity in ‘Kalyani’ is limitless. It gives you a sense of challenge in trying to create within a boundary which actually is a big accessory for your mind so that way it is bounded. Otherwise, it is like Hindustani music. Who is your target audience when you perform? Any music lover is my audience. I don’t try to perform to any particular type of audience. That’s how we keep our music. How difficult is it to connect with the old generation, and for them to accept the new alteration in carnatic music? If you know your system, it’s not very difficult to connect to the older generation at all. And they don’t accept change because they have grown-up listening to one aspect of music they are attracted to. So, if we come with a different idea like any other walks of life, change is a difficult thing to understand for the older generation. That is there in carnatic music also. But as a musician and as an artist we try to connect with its art form and express the feelings and emotions. You as an artist shouldn’t shy away from doing things that connect you to the areas that express you, without being worried about the criticism or comment you are going to get because in the long run it does help you. What kinds of niche have you and your brother created in music? I along with my brother have been successful in creating awareness amongst the next generation; about the possibility that is available for instrumental music in an art form. And that carnatic music is not three-dimensional but multi-dimensional. Indian music is multi-dimensional. What kind of musical instrument would you like to play apart from violin? I have never given it a thought. Because for me, violin is an instrument in which I have acquired a skill. I am comfortable expressing better because of the instrument and there is nothing inadequate that can’t be played with a violin. I never thought of it, basically. Who do you owe your skill of violin too? My father, my brother and myself. What are some of the positive changes you have witnessed in your career? One good thing about my journey is my father and my brother. I and my brother stay together, so I would say what my father told us, he said that we should perform without expectation. You perform with all your mind and whatever has to happen will happen. You need to have lots of patience and work hard and go through the grind and things will happen. So that way when we performed expectations were not much. When we were very young, when I was 17, the chief minister of Tamilnadu M G Ramachandra honoured us with the title ‘Great artist of Tamil Nadu’. It was a very big honour at that stage and that was the career changing moment. Then, playing with great maestros like Umalayapuram Sivaraman, Late Valangaiman sir, Palghat Raghu sir and Vinyak Vikkuji was all a big learning experience and then the other big change happened in our career when we started playing with Zakir Hussain bhai. It was a really a great moment for us. The vision of music changed. At least, my vision of the understanding of the art form totally changed. What should the future generation of musicians be aware of when they take up classical as their career? I think they are very fortunate. The social media has so much to offer that downloads is available, music libraries, music content of performances of great legendary artists is also accessible. They have so much to learn other than what they have to prove. They can look forward to having a great experience of music but they should be ready to go through the grind. Patience is important, you can get the name. Getting the name is no big deal, you can achieve it through the media, but sustaining quality is important to provide quality performance. Quality content is very important and for that you need to have quality knowledge and quality experiences. So your input should be of a very high quality to give output of very high quality. They have to spend long amounts of time in understanding what they want to be and then get into the system. Are you planning to launch any new album? We are working on the album called ‘Season’. It should be coming out shortly. We are in the process of launching our ‘Ragapravaham’ in multi-cities. We have launched it in Bangalore, Hyderabad and Mumbai. We will be doing a launch in Chennai very soon. Albums keep happening so then only you can re-invent yourself as a musician, otherwise, you are stagnant. Which do you enjoy more, a live performance or an album? I enjoy performing. Performing live is the best experience you can have as a musician. This form of interaction with the audience can’t be replicated by studio. Any musical concerts before the year end? In December, we perform a lot. Pinnacle of carnatic music comes every December, there is big musical festival happening in Chennai unparalleled to any other part of the world. It is something that is very unique in Chennai. There are some 50-60 organizations, having over 5,000 concerts in that one month, various artists performing at various levels from junior to senior most, from most popular to unknown in Chennai. We will be performing in few places as we do every year. We are eagerly looking for the next generation of musicians to perform and look at how they are doing, how thing are happening and see how the music scene is changing. This helps bring in fresh ideas, performance, thoughts and only then you will be inspired to do better. Every year, we perform in January at the place called Bharat Kalachar at Chennai. We are looking forward to that and every year we perform at Jaya TV where we do new presentations. This year also we will do a presentation in Margazhi Maha Utsavam on 25 December. We get a positive energy from our performance and I don’t think that anything else can replicate that.